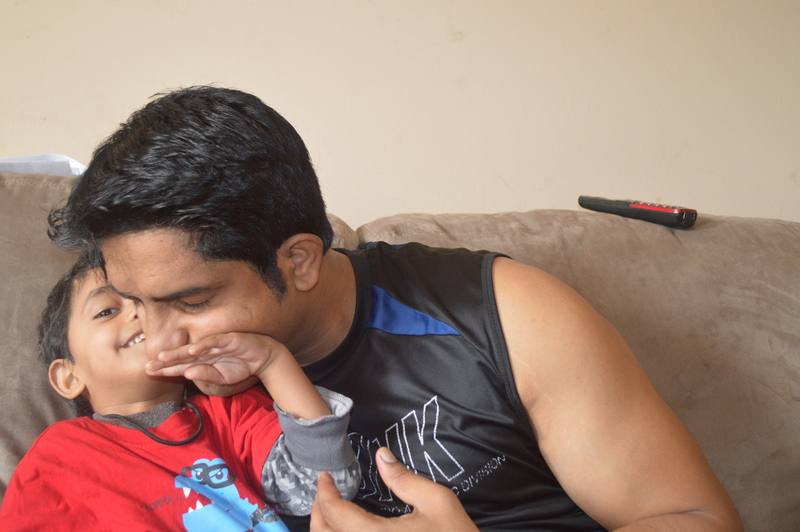 In His Papa’s Shoes | My Journey So Far…. I have yet to see this in real world, however; in my life with my two twin sons, what I do see is amazingly beautiful. Both are totally different personalities, in some way, poles apart. 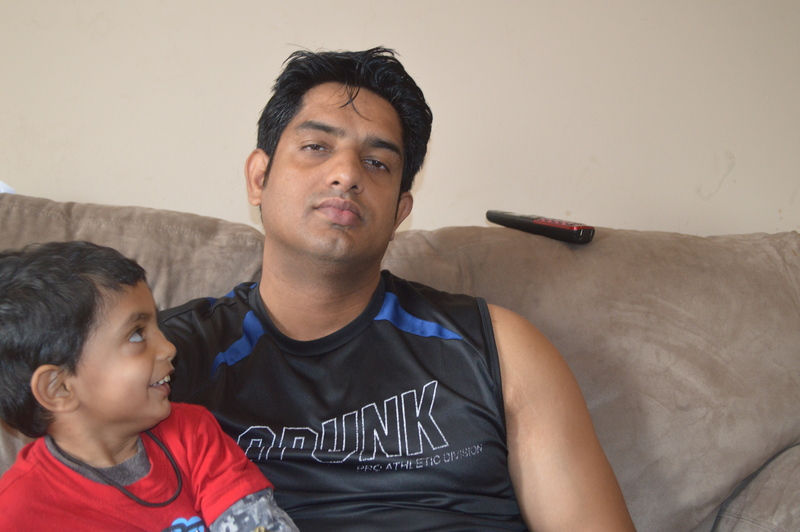 Surprisingly, one who have inherited my looks, behaves mostly like his father; and the one who has got his dashing looks from his Papa, is all me from inside. Every morning, it’s his daily ritual to wake up with his Papa, wait at the door of bathroom, till Papa comes out, all freshen up. 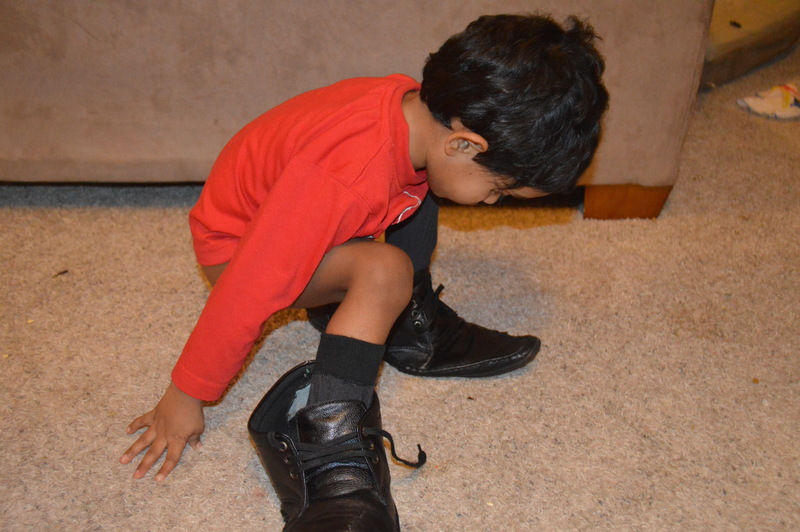 Both father and son will spend nearly an hour in deciding what to wear. Renne will even try to buckle up the belt for his Papa. LOL… that looks so funny, when he tries that. Papa is hardly ready, when Renne starts running towards his shoe cupboard. He will pick out the black formal shoes (always, I don’t know what’s his fascination with them), and then he will search for the socks. He has to search because his Papa is good in throwing things around. 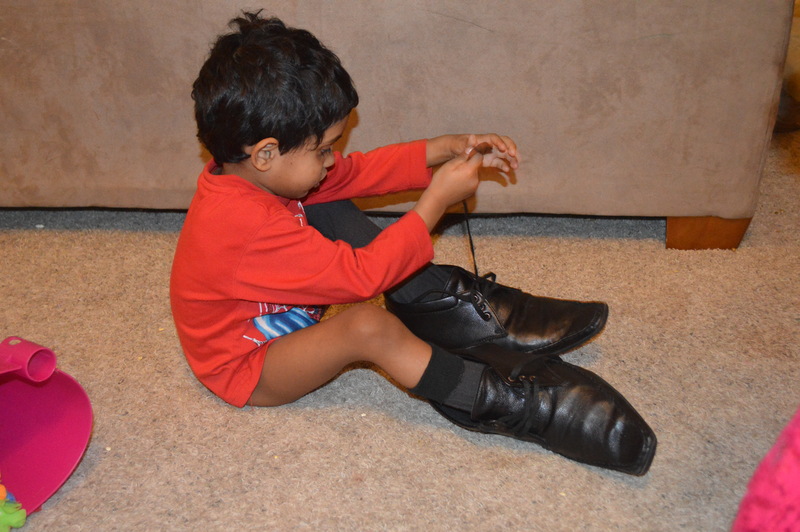 By the time Papa is seated to put on the shoes, Renne is busy finding matching socks. He somehow manages to do so everyday (even I am not able to search them sometimes), and will hand them over one by one to his Papa. 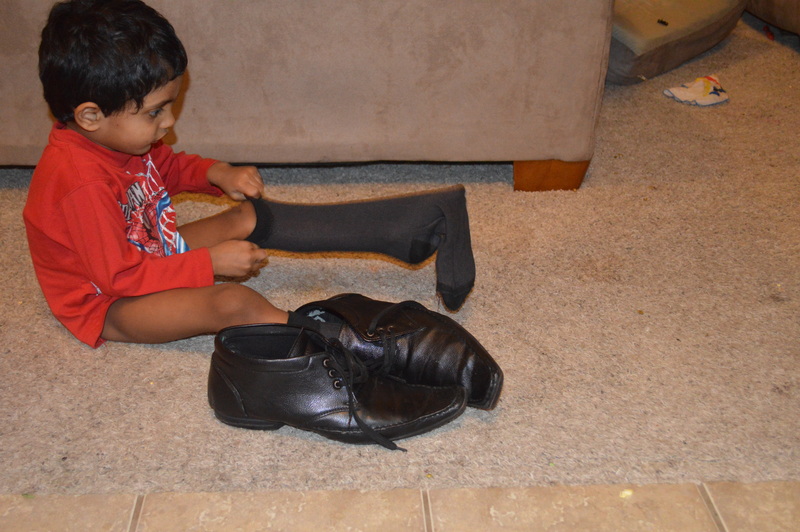 One sock at a time, then the shoes. Papa just have to do one thing on his own – comb his hair, because Renne can not reach there, otherwise he would have done that too. Next he will give lunchbox and tea to his Papa. From where did Renne learned all this? Who else, than his Papa himself? I have seen my hubby, still taking care of his father’s appearance, whenever he is stepping out of home. His shoes are shining or not? Clothes are cleaned and ironed or not? Who washed his car? Which driver is going to drive today? What is his schedule? How much time he will spend in each of his meeting? Phew!!! Pingback: Saturday Scroll – Something Funny | My Journey So Far…. Pingback: Wednesday Words – Do Not Marry a Tall Guy | My Journey So Far…. Pingback: Wednesday Words – I am 1 Year now | My Journey So Far…. Pingback: Tuesday Talkies – Happy New Year | My Journey So Far…. Pingback: Wednesday Words – To Teach Kids Independence or Logic? | My Journey So Far….